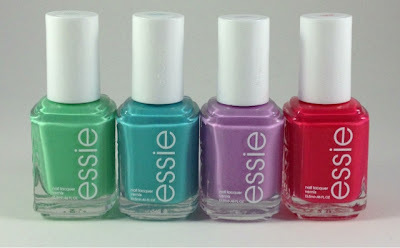 Essie continues to be my favorite drugstore brand and here are more reasons why! The summer 2013 Resort collection has just hit stores and I have no complaints! The 2013 Resort collection inclues First Timer, In The Cab-ana, Under Where and Come Here! The colors are bright and bold with some being a touch pastel. I really enjoy these colors for summer, they're making me feel all hot and sweaty already. First Timer is a bright lime green with a touch of white to brighten and lighten it up. This is only two coats! The first was almost enough coverage and I added a second for good measure. The formula was creamy and smooth and the color payoff was bold. 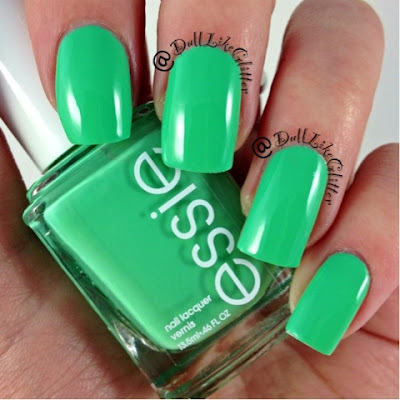 If you're a green girl definitely pick this color up. In the Cab-ana is one of my favorite colors in the entire world. A bright, light sky blue is all I need to look at to feel totally and completely relaxed. This polish was just as amazing formula-wise as First Timer and only needed two coats for perfect color and coverage. The color is bright blue but has a touch of robbins egg which lightens it up slightly from other bold summer blues. I may be heading to the store tomorrow to buy four more backups of this color so I have a lifetime supply....who am I kidding, I'm definitely doing that. Under Where? was the only polish in this collection that did not have as amazing coverage as the others. One coat was streaky and thin. Two coats was still thin and then finally with three I had the color I wanted. 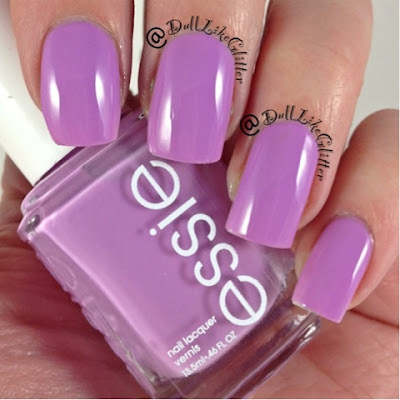 This lavender is a bit too light for a summer color in my taste. Last but not least is Come Here! This polish really beckons to you. 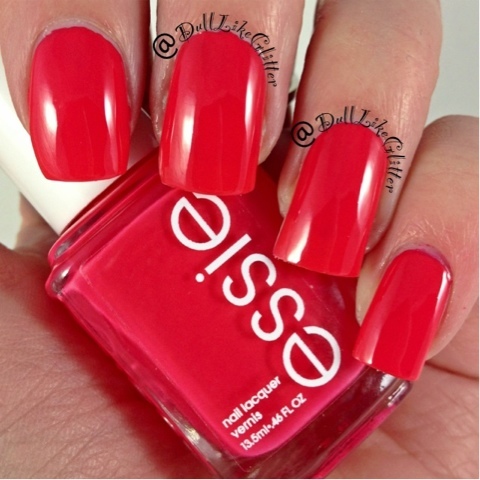 It is a bright neon pink with red hints that shouts from across the room! The color and formula was fantastic. Two coats and I was good to go. The real life color is actually a little more neon pink than orangy as its photographed. You know it is a good neon when the colors don't show up right in pictures! This polish is such a beauty you need to check this out in stores to see what I'm talking about! I have no doubts you'll end up walking out of the store with it. Overall I greatly enjoy the Esse 2013 Resort collection. First Timer, In the Cab-ana and Come Here! are all Essies grade A formula with gorgeous, bright colors. The only one I would skip is Under Where? This polish was a bit too thin and streaky for me. I feel it is a little bit off with all these other bright, happy summer colors. If you are a fashionista gearing up for summer, your beauty routine won't be complete without these! Everyone wants their honeymoon to be very special and amazing. In order to make it special you need to plan for a destination which helps to make https://www.imanali.in/manali-honeymoon-package-chennai your trip mind blowing. A place of common interest can do the trick for you. So make sure you choose a mutual destination. The Honeymoon is the salient time for newlyweds to have some good memories. https://kullumanali.org/kullu-manali-honeymoon-packages-from-kolkata Planning a trip from Kolkata to Kullu Manali is the perfect honeymoon destination. The couples can enjoy the adventurous activities and picturesque of the place.